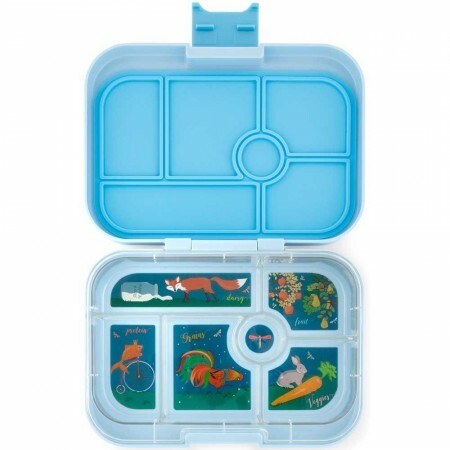 Blue Yumbox Original is a bento-style lunchbox with 6 compartments and a single lid. Perfect for children who like variety, the Yumbox Original is divided into 5 half-cup portions of the key food groups, plus a dip/treat. Pack wet foods like yogurt and dips (but not water or runny liquids). Luna Blue colour. 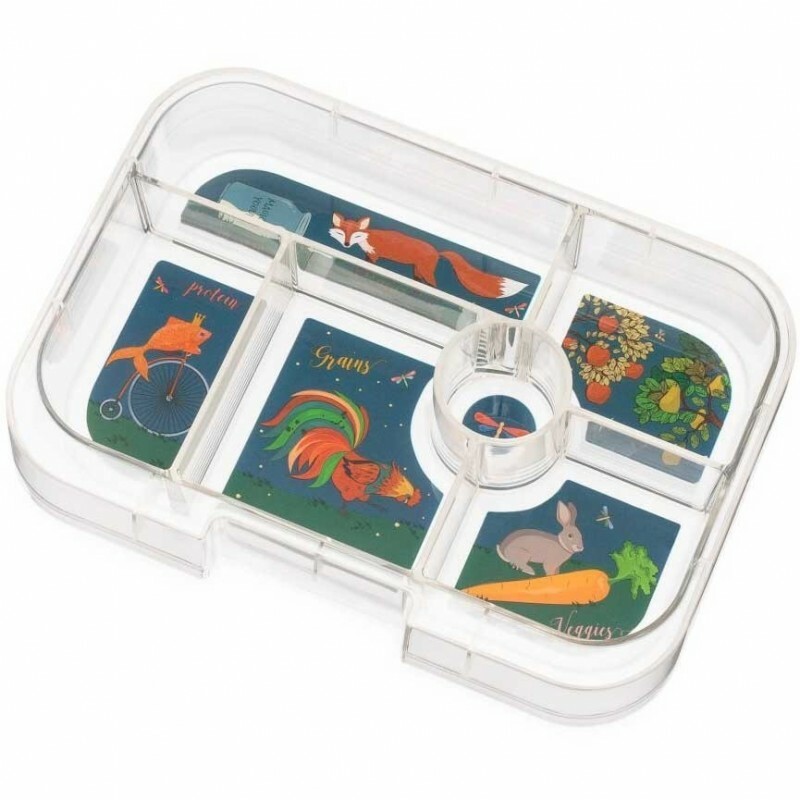 Includes blue box and tray insert with enchanted forest themed illustrations. YumBox eliminates the need for zip-lock bags, multiple lids, plastic wrap, and single use disposable containers. Turn your child’s meals into a food adventure by offering a healthy variety of foods that will instill good eating habits in a fun way. 100% BPA free, Phthalates free, CPSIA and FDA compliant. Five main food compartments accommodate ½ cup servings to assist parents in preparing a healthy lunch with a variety of foods to create a balanced meal. Sections are labelled; dairy, protein, grains, fruit, and veggies. Easy to clean. The tray which fits snuggly in the bottom half of the exterior box can be removed easily for cleaning or packing. The Panino design is perfect for adults and growing children of all ages. Compact and fits perfectly into our SoYoung lunch box totes. If you are packing food that needs to be kept cold, we recommend packing Yumbox in a thermal tote with an ice pack to keep contents cool. Dishwasher safe. Top rack only. Handwashing is recommended for the outer shell and/or removing it before the dry heat cycle. Not to be heated over 65 degrees celsius. 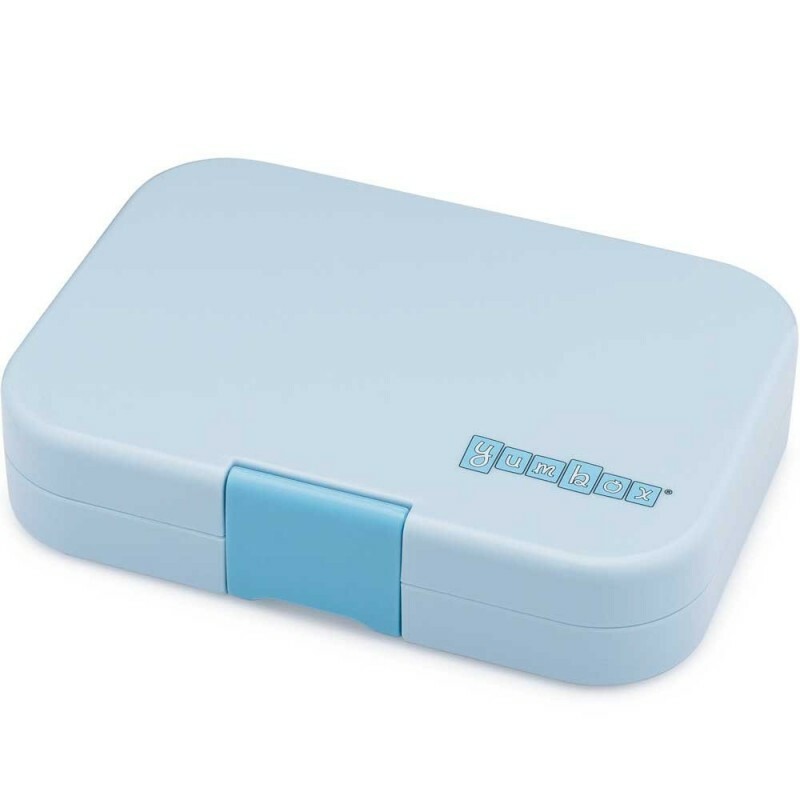 Yumbox exterior shell is not microwave safe and it is not recommended to microwave the tray. Remove any excess liquid from canned fruit, applesauce and yogurts. Keep contents cool by adding an ice pack to your lunch tote. When closing Yumbox, press down on the lid with the palm of your hand and snap latch to closed position to create the best seal. Do not pack youghurty drinks, soups or runny/watery dressings. You can pack foods with the consistency of ranch dressing, ketchup, chunky salsas, hummus, yogurt, and veggie dips. These are all great options. If you are not sure if your food choice is too liquidy to pack, we suggest that you conduct a quick test beforehand. Simply add the test food to a compartment, close Yumbox properly and give it a good shake (or leave it on its side for 10 min). Set Yumbox back to normal position and open to see the results. 21.5 cm x 15 cm x 5 cm and weighs 600g. We are so happy with this lunchbox, the colour is lovely and the sections are the perfect size for a toddler. It's great to be able to offer a variety of foods when out and about using this. Used daily. Has maintained food fresh at school and outings. Love the pictures too,very whimsical.